Full load displacement: 127.000 Kg. For further information contact :CRN, Via E. Mattei 26, 60125 Ancona (Italy); tel. 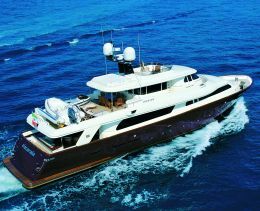 +39 071 5011111; fax +39 071 200008; websites: www.crn-yacht.com and www.customline-yacht.com; e-mail info@crn-yacht.com and info@customline-yacht.com. This sixth unit of the Custom Line Navetta 30 possesses elements capable of emphasising precisely such gifts of personality. One of these, most immediately perceptible, is the choice of hull colour: bordeaux red. 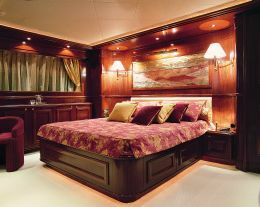 We find the same colour below decks, especially in the fabrics and materials used for coverings, giving warm and welcoming atmospheres to each individual environment. 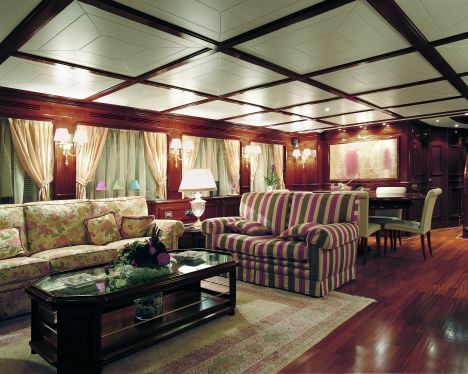 "Ziacanaia" was developed with a main eye to on-board life: ample spaces then, masterfully worked to be comfortable in all situations, relaxation accessories, welcoming furnishings and a gym complete with all the necessary equipment to ensure that the owner and his guests can keep in shape during their stay aboard. Externally "Ziacanaia" has numerous stylistic innovations, especially with regard to the forms of the superstructure which succeed in harmoniously reconciling the classic with the modern in a play of soft lines that lend personality to the entire project. A special element is the choice of the side windows of the main deck which, uninterrupted, themselves become an important stylistic element in the balance of the whole. Equally important to the visual impact is the softness of the forms in the area forward of the coach-house which is gently linked with the upper deck. As for the interior layout, as we said earlier, "Ziacanaia" was designed to be lived in. 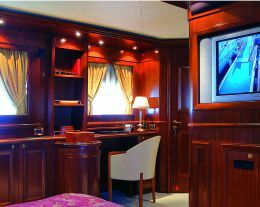 So the main deck, over and above the owner's cabin which occupies the entire forward area of the structure, houses a saloon featuring a day area that has been highly personalised by the owner with a sofa designed by himself in original forms and specially created by the boatyard. In this zone we find bright colours and floral patterns, sobered by the wooden flooring with a perimeter insert in maple and by the furniture in Afromosia wood. 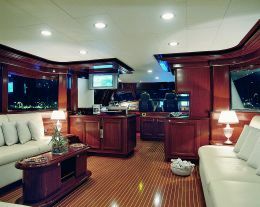 An internal companionway leads from this area to the upper deck where the wheelhouse, done out in leather, has a spacious conversation area aft that is bright and the ideal place to cool off on hot summer days without missing the splendid view of the sea. Continuing aft on the same deck there is a table for meals in the open air, protected above by the extension of the upper mid-deck. Farther aft there is a relaxation area for sunbathing and also housing for the tender and sports equipment plus, davits for launching and recovery. 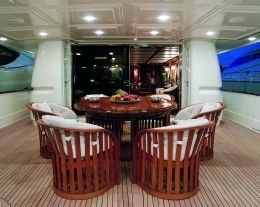 The upper mid- deck is actually a terrace overlooking the sea where you can enjoy the view far from indiscreet glances. The lower deck - sorry about the sudden skip but it was inevitable - houses the guest and crew quarters, as well as bathrooms. 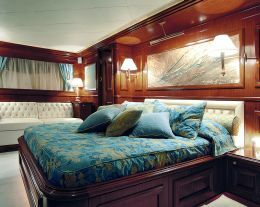 This deck too evinces elegance and care in the design and creation of each individual element, making each environment comfortable and in line with Ziacanaia's vocation as "refined lady of the sea". One of the technical particularities aboard is the Anti Rolling Gyro system, a special stabiliser developed by the Japanese company Mitsubishi Heavy Industries, which ensures almost total immobility of the vessel even when at anchor. This system is especially suited to suppressing roll while under way or when stationary, thus relieving many from the bothersome effects of seasickness. Conceptually simple, the system is based on the application of a gyroscope which transfers heeling information to a central unit that controls the stabilisers which then maintain the vessel in perfect trim, suppressing the angular speed of rolling movement. Thanks to this system there is considerably more comfort on board. 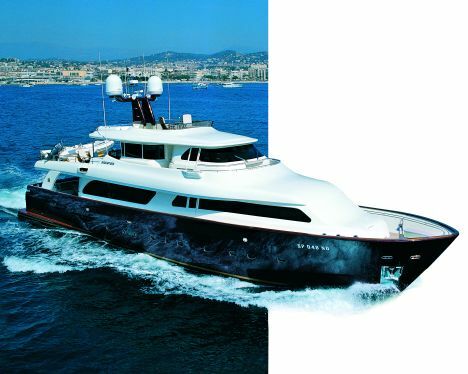 "Ziacanaia" is one of the first pleasure craft to benefit from it.